RESOL Solar Pump Stations - Integrated pump station with Wilo Star S21 3-speed solar pump. Comes with Integrated RESol DeltaSol BS/plus advanced controller. Complete solar control system including solar working station with drain fill valves and shut off isolation valves. 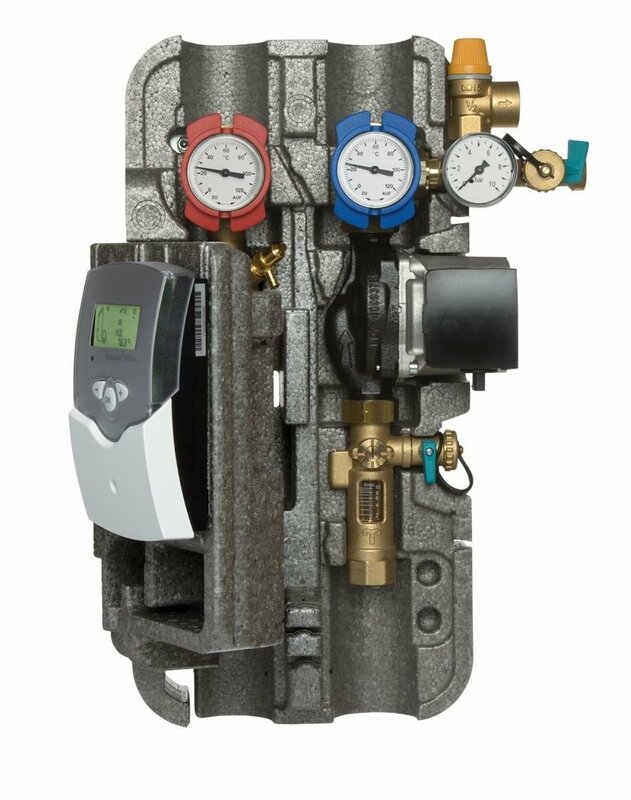 Patented air scope, flow meter, pressure release valve, pressure guage, temperature guage. Wilo Star21 3-speed pump included. Quality brass components are high temperature rated. Note: comes with RESOL controller - comes with 3/4" compression connections. The controller Type BS Plus> is integrated in the insulation. It is designed for the application in various basic systems. This controller has 2 standard relay outputs and 4 sensor inputs for Pt1000 temperature sensors. The illuminated display with system monitoring (with blinking symbols for a clear allocation of the indicated data) permits a simple and clear appliance and function control. 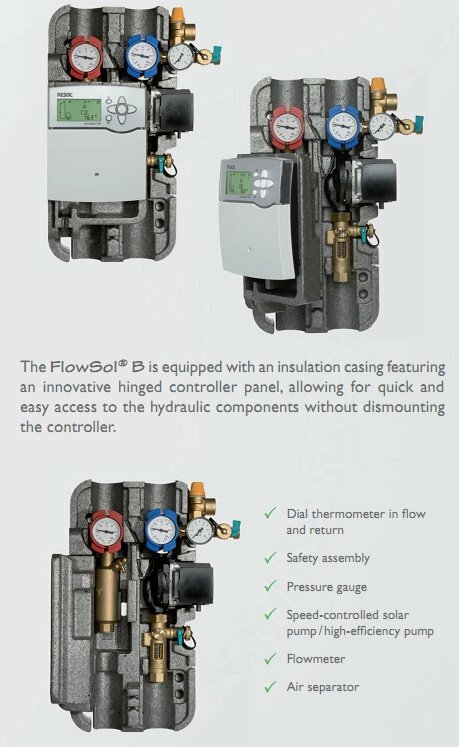 The controller is equipped with a storage temperature limit, an operation hours’ count, a thermostat function, a heat metering as well as (selectable) pipe collector functions. V-Bus. UL/CSA certified. Supplied with 4 Pt1000 sensors (Ø6 mm, 1 with silicon wire) and 4 immersion sleeves (1 x 60 mm, 2 x 100 mm and 1 x 150 mm long).